Hi all! So I made another Zippy Top. If you remember from my first one I made (you can see it here), I absolutely loved it and couldn't wait to make a bunch more. Well, being a mom and having a list 20 miles long of things you'd like to sew in your "spare" time, means I just now found some more time to squeak out another top for me. And guess what? I absolutely LOVE this one too!! I decided to try it out in a knit this time. It's a super thin tissue knit I spotted at Joann Stores, and normally I'll take my time and mull over a fabric purchase a little bit. This one I grabbed the second I saw it and new immediately it would become a shirt for me. 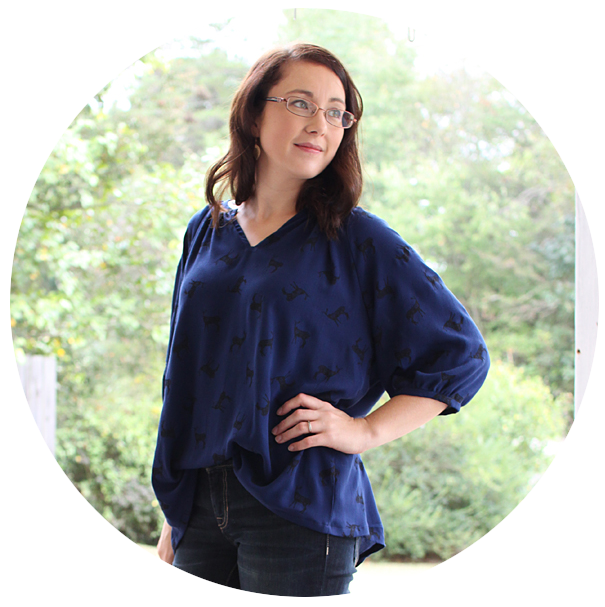 The only draw back is that it is sheer... My friend Monica just posted about sheer knits in her last post, and I have the same feelings as her. I wish this one would be twice as thick! But even so, I do love it and I happened to have a tank in almost the same color so I just threw that on underneath and we were good to go. Since I was making it in a knit with quite a bit of stretch, I sewed one size down from my last one. I'm really really happy with the results. If I were to do it again in a lightweight knit that was not as sheer though and I wanted it to fit a little closer I'd actually go down one more size. The other thing I did to "hack" the pattern was to add an exposed zipper in the back. To do this I cut the back of the pattern in two pieces (after adding seam allowances) instead of on the fold. 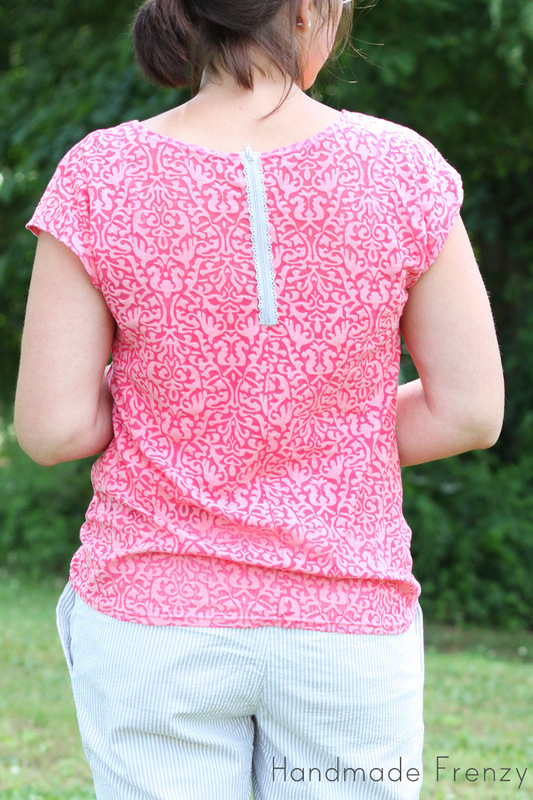 Then I referenced this lovely tutorial found on The Sewing Rabbit, written by Lexi Made. 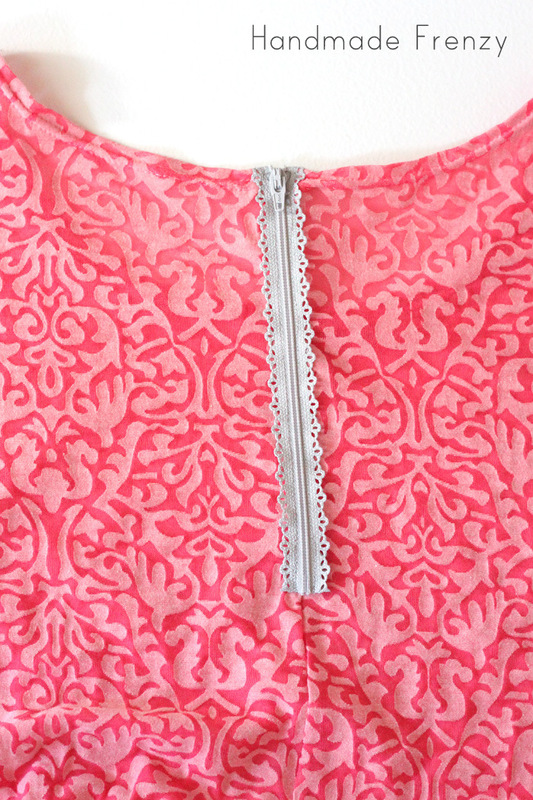 Here's a close up of the dainty zipper I found (at Joann Stores, of course! :) ), and you'll know why I did the exposed zipper hack! I think I almost squealed when I found it. This is so super easy to do. In fact it only took one picture to show you. I have only been able to find 3/8" clear elastic everywhere I've checked and I was only using a 1/4" seam allowance on the top. This was an easy fix though, I simply cut the length I needed for the shoulder seam and then cut it in half lengthwise. See how easy? 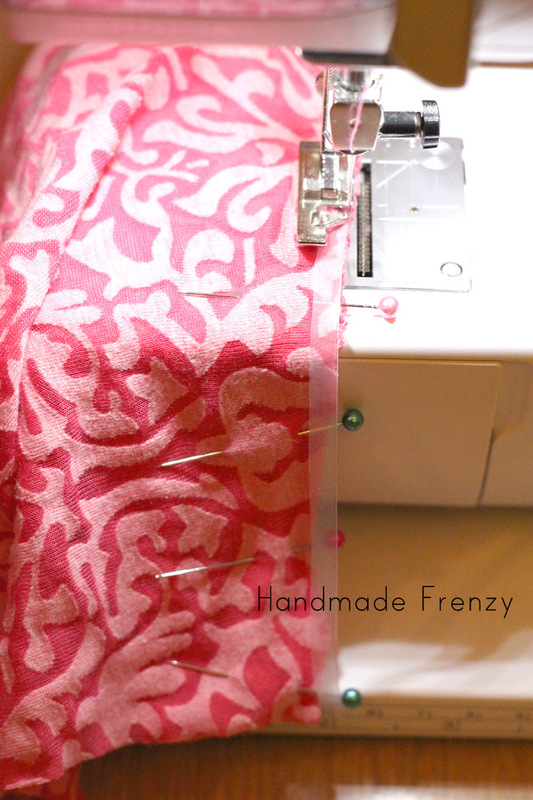 Simply pin the fabric together and then lay the clear elastic on top of the seam as you sew! 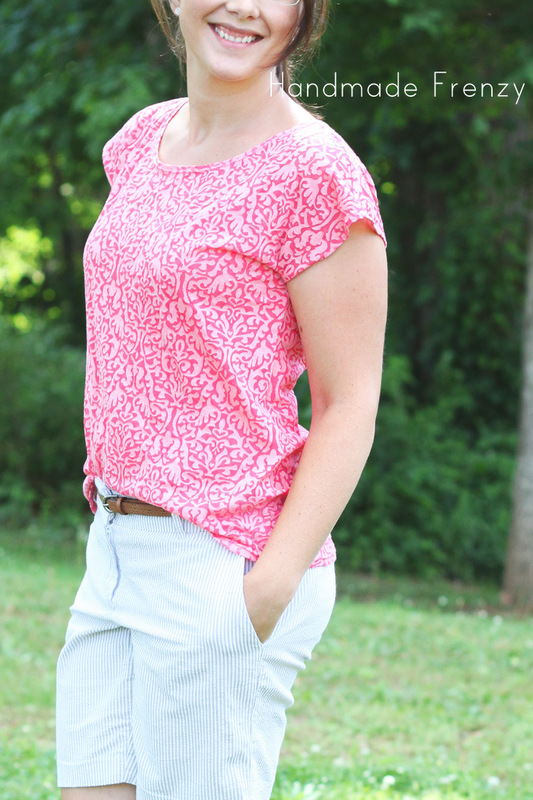 It's going to be the perfect top to wear all over the place this summer. I think it looks great paired with my seersucker shorts I found at Target last summer for $2. No, not a typo! LOL. "Mom, why are you kissing my head...??" Feel free to pin away!! Shoes: Old Navy, 2 years ago, but they still have the same ones! You look great!! 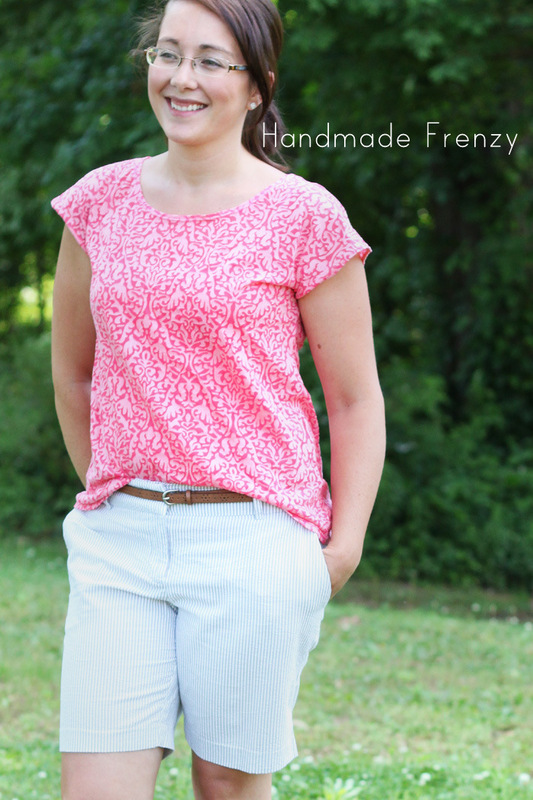 I just saw this fabric the other day for the first time, it makes a great zippy top!!! That pattern is really pretty swirled in it. I kind of like the sheer shirts over tanks, look, though, so this works great for it. 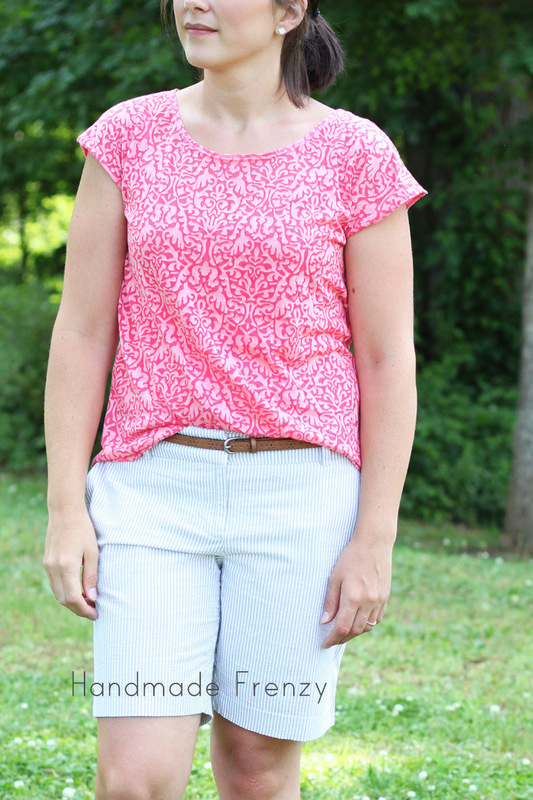 I'm seriously quite impressed with how well this fabric translated to a casual top--well seen! And your zipper...too sweet! Ooh...that zipper is perfect! I love everything about this top! So pretty! I love those zips...such a cute way to use one! Mum, why are you kissing my head hahaha Love it :) Seriously, love the tea, you you wear it so well! That zipper - I want at least one in just baout every colour, but can only find them online... If JoAnnes have then, maybe our Spotlight will start stocking them soon? Thank you Jenya! :) The zipper, I know!! Joanns only had white and gray... I don't know if they'll be getting more colors later? I didn't even look online, did they have more colors!? Love this version too! thanks for showing how to add the clear elastic. Thanks! I'm wearing it right now actually :) And no problem, I love passing on things I've learned because that's exactly how I learned myself!